Capture the moment on the 16 megapixel front camera with ZEISS optics and dual-tone flash on the new Nokia 6 make every picture worthy of sharing without hesitation. Or record 4K video and grab high-quality stills in an instant, then zoom or crop without compromising on quality. Snap a selfie on the 8 megapixel front camera, or record what's happening in front of and behind the camera simultaneously with Dual-Sight mode. The Durable 6000 series aluminium unibody starts with a demanding sculpting process that transforms a single solid block of aluminium into the unibody of a durable smartphone you can take anywhere. The new Nokia 6 has a strength you can depend on when the going gets tough. Functionality is met with aesthetics thanks to the Diamond-cut edges that are finished with a bold colour accent. Enjoy high end viewing experience, on the 5.5 inch IPS full-HD display, protected by Corning® Gorilla® Glass 3. A resolution of 1080 x 1920 pixels and a16:9 ratio adds clarity and dynamics. 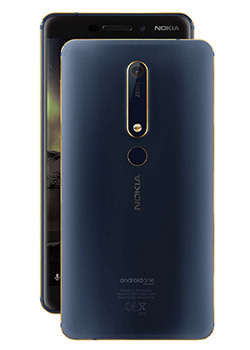 The new Nokia 6 (Nokia 6.1) features Nokia spatial audio, recording audio with two microphones for high-fidelity sound in every clip you shoot. 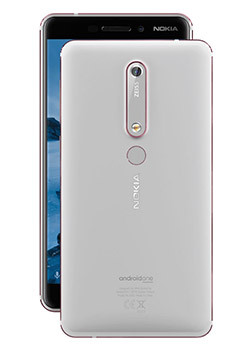 Powered by a Qualcomm® Snapdragon™ 630 mobile platform, with 3 GB of fast, LPDDR 4 RAM, the Nokia 6.1 is powered for a modern life. Enjoy plenty of space with 32 GB mass storage¹ and MicroSD card slot² (support up to 128 GB), Secure and up-to-date Android Oreo with regular updates and High-fidelity spatial audio recording.